Medical Forms may be required for participants of certain activities.See the event description or contact your leader for details on whichform(s) may be required. Pack Campouts: EVERY member of thefamily attending a pack campout MUST have a new medical form on file.Complete parts A and B (No doctor sign-off required). ResidentCamp (Overnight): EVERY scout and parent attending MUST have one of thenew medical forms on file. Parts A, B and C (Doctor sign-off requiredon Part C). 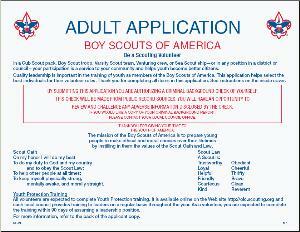 Adults interested in helping the troop should discuss their interests with the Scoutmaster. All adult leaders must complete an application.